Founded in 1948, Miracle-Ear has built a reputation as one of the most easily accessible and innovative hearing aid retailers. In fact, the first electronic hearing aid designed to be worn in the ear was what kicked off by Miracle-Ear in 1955. Innovation didn’t stop there, in 1988 they also created the first programmable hearing aid. They have kept up to date with emerging technology, creating hearing aids designed to use in the water, invisible hearing aids that rest only in the ear canal, and converting to all digital hearing aids. Miracle-Ear is a large enterprise. It operates in 18 countries, and boasts 1,200 offices in the U.S. alone. They even created a Miracle-Ear Foundation, which has donated over 10,000 hearing aids and services to those who cannot afford them and meet the foundation’s eligibility requirements. 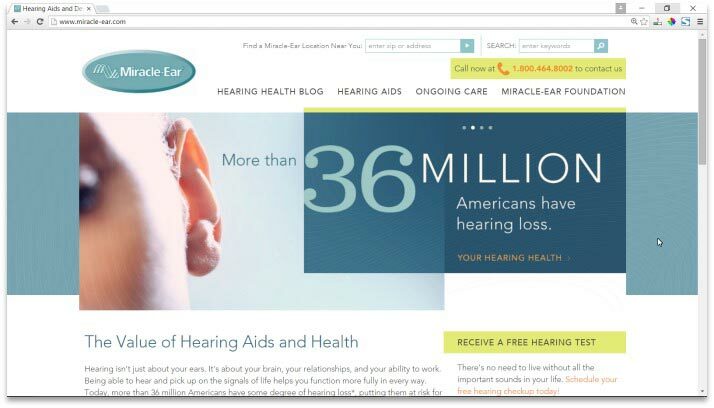 Miracle-Ear is the largest hearing aid retailer in the United States, which says something about both their marketing strategy as well as their popularity. Because there are stores all over the U.S., getting service is relatively easy, even if you are traveling or moving. One major flaw with Miracle-Ear is the prices, both upfront costs and any costs you may incur later on. Hearing aids in general, especially modern ones that utilize the newest technologies, tend to be expensive and Miracle-Ear is no exception. In fact, their prices tend to be higher than comparable hearing aids. Of course, they do come with added perks, such as free office visits as well as adjustments, programming and annual hearing tests. These may help you save on other costs later on, but probably won’t totally offset the cost of the hearing aid itself. However, it is important to recognize that when going in for testing or adjustments, a trained audiologist is not always present. Some people also complain about Miracle-Ear’s marketing. Some find it difficult to be removed from the mailing list, and employees complain about the telemarketing calls they have to make. Some question whether Miracle-Ear’s is really concerned about their customers, or just after their money. In terms of the product itself, most people are very happy with their hearing aids. Although some people struggle to make adjustments and find a setting that best suits their needs, hearing has been shown to improve. Most people’s lives can be greatly improved by the use of a hearing aid, and Miracle-Ear offers a variety of options to suit many levels of hearing loss and particular needs. Miracle-Ear provides state of the art devices that also come with the added benefit of lifelong care and adjustments at one of the many offices throughout the U.S.
Miracle-Ear may not exactly be a ‘miracle,’ but will improve hearing and help people function better in their daily lives. Getting used to any hearing aid may take some time and adjustments, which is also true for Miracle-Ear. Despite high prices, most walk away with quality, state of the art devices that also come with the added benefit of lifelong care and adjustments at one of the many offices throughout the U.S. While there have been some complaints about the product, overall it is a good option to consider. However, it’s always recommended to speak to your doctor and audiologist to determine what hearing aid or retailer might be right for you. Second opinions are important, especially when thinking about purchasing something as expensive as a hearing aid, which is true not just for Miracle-Ear, but all hearing aid retailers.